Two main factors – the startup of new capacity plus tariffs on exports to China – have resulted in large regional shifts in US exports of linear PE. Exports have increased to all regions but especially to Western and Eastern Europe, and combined shipments to those regions now exceed those to Asia-Pacific. The US exports linear low density polyethylene under two Harmonized System codes, one for LLDPE and one for ethylene-alpha-olefins-copolymers (EAOC). 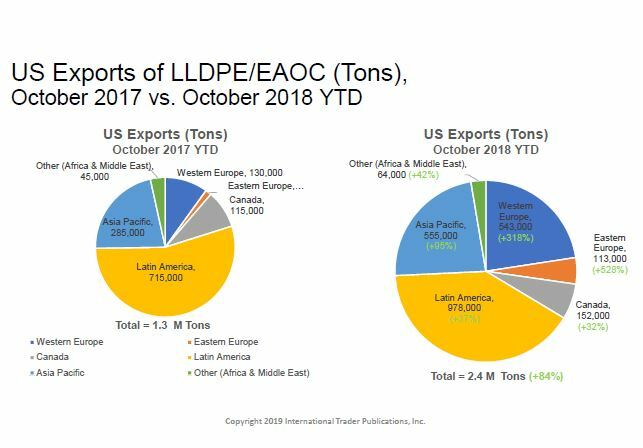 Exports of these totaled 2.4 million tons through October 2018, up 84% from the same period in 2017, based on statistics published by the US government. The US data shows that Latin America remained the top regional destination, with 978,000 tons through October 2018, up 37% over October 2017 YTD. Although shipments to China slowed in recent months, exports to Asia-Pacific nearly doubled for the period, up 95%, to 555,000 tons. US exports to China through October were 198,000 tons, up 44%. Exports to Singapore jumped 163%, to 131,000 tons, and volumes increased to many smaller volume markets in the region. The most prominent change was exports to Western Europe, which more than quadrupled, up 318%, to 543,000 tons through October. Exports to Eastern Europe, mainly Turkey, jumped 528%, to 113,000 tons. Combined, these equaled 656,000 tons through October, an increase of 508,000 tons from the same period last year. Developed from International Trader Publications’: US Polymer Trade Report and Identified LLDPE/Ethylene-Alpha-Olefins-Copolymers World Trade Report. This entry was posted in Trade Trends and tagged Asia-Pacific, China, Eastern Europe, ethylene-alpha-olefins copolymers, Latin America, linear low density polyethylene, LLDPE, LLDPE/EAOC World Trade Report, Singapore, Turkey, United States exports, US Polymer Trade Report, Western Europe on January 18, 2019 by JJSUDOL.